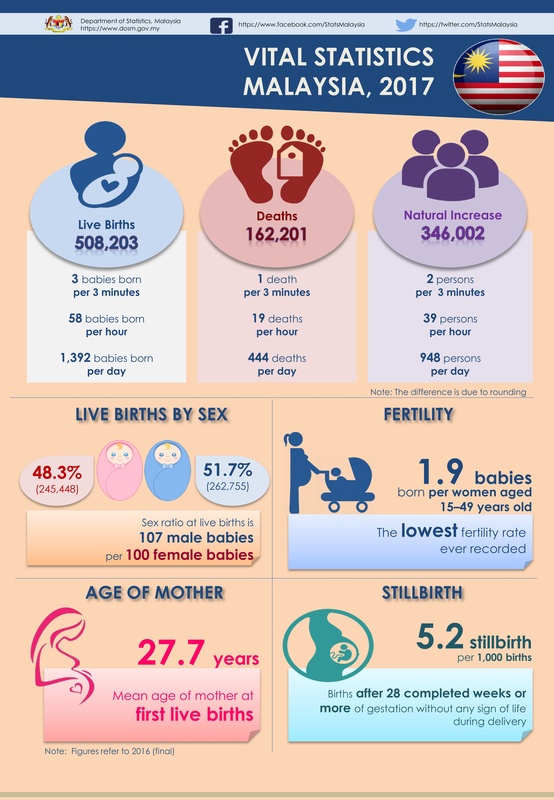 The number of live births recorded in 2016 was 508,203 babies with a decrease of 2.5 per cent as compared to 2015 (521,136). The crude birth rate declined from 16.7 (2015) to 16.1 (2016) per 1,000 population. Male babies born in 2016 were 262,755 (51.7%) which is 17,307 more than female babies (245,448, 48.3%). However, the crude birth rate for both sexes was 16.1 per 1,000 population. The highest crude birth rate by state in 2016 was recorded by W.P. Putrajaya (30.4) while the lowest was Pulau Pinang at 12.7 per 1,000 population. Julau district in Sarawak recorded the highest crude birth rate in 2016 with 26.9 per 1,000 population followed by Marang, Terengganu (24.8) and Kuala Terengganu, Terengganu (24.4). Meanwhile, Selangau district in Sarawak recorded the lowest crude birth rate of 1.9 per 1,000 population followed by Kinabatangan, Sabah (3.9) and Pakan, Sarawak (6.2). In 2016, the total fertility rate per woman aged 15-49 was 1.9 babies, a decrease from 2.0 babies (2015). The total fertility rate in Malaysia has been below replacement level 2.1, that is the average number of babies born per woman throughout her reproductive life has been insufficient to replace herself and her partner. Women aged 30 to 34 years recorded the highest fertility rate in 2016 with 120 births per 1,000 women in the same age group. There were 162,201 deaths recorded in 2016, 4.1 per cent more than the number recorded in 2015 (155,786). The crude death rate increased from 5.0 (2015) to 5.1 (2016) per 1,000 population. 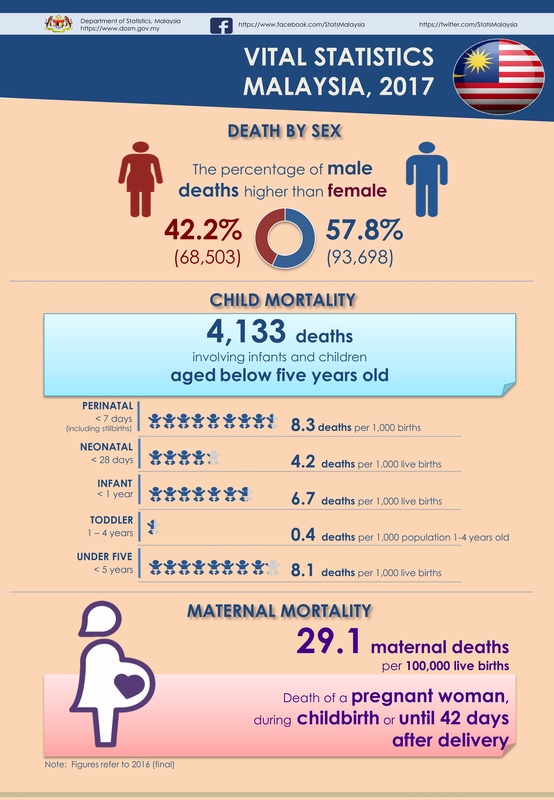 The crude death rate for males and females in 2016 showed an increase as compared to 2015 from 5.6 to 5.7 and 4.4 to 4.5 per 1,000 population respectively. 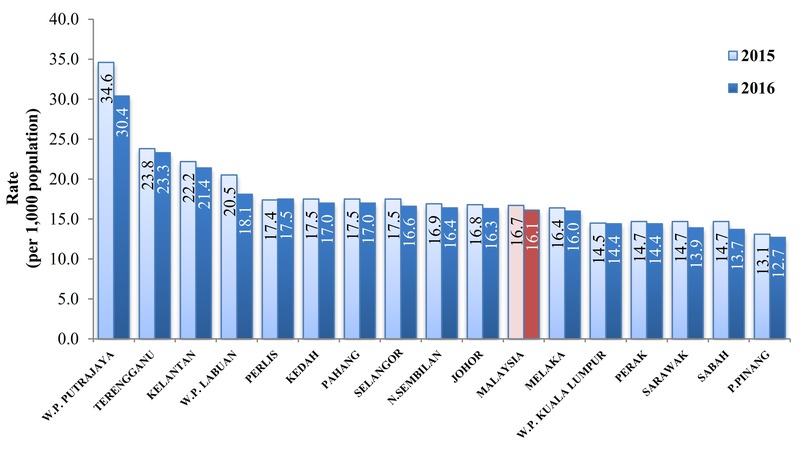 The highest crude death rate by state was recorded by Perlis at 7.5 while the lowest was W.P. Putrajaya at 1.9 per 1,000 population. Kuala Penyu district in Sabah recorded the highest crude death rate in 2016 with 9.8 per 1,000 population followed by Julau, Sarawak (9.2) and Pendang, Kedah (8.8). Meanwhile, Kinabatangan district in Sabah recorded the lowest crude death rate with 0.8 per 1,000 population followed by Belaga, Sarawak (2.1) and Kunak, Sabah (2.2). The number of natural increase recorded in 2016 was 346,002 people with a decrease of 5.3 per cent as compared to 2015 (365,350). The crude rate of natural increase declined from 11.7 (2015) to 10.9 (2016) per 1,000 population. The crude rate of natural increase for males and females in 2016 showed a decline as compared to 2015 from 11.2 to 10.3 and 12.3 to 11.6 per 1,000 population respectively. The number of stillbirths in 2016 recorded an increase as compared to 2015 i.e. from 2,325 to 2,648 babies. This increase contributed to the rise in stillbirth rate from 4.4 (2015) to 5.2 (2016) per 1,000 births.